Spicy Broccoli & Chicken Stir-Fry w/ Jasmine Rice — Happy Food Co.
SLICE the chicken breast tenders into bite-sized pieces on cutting board. SPRINKLE the chicken tenders with oriental five spice on cutting board. Season to taste with salt and pepper. HEAT TWO tablespoons hot chili oil in a large skillet over medium-high heat. ★ For MILD, substitute regular extra virgin olive oil from your pantry for the hot chili oil. ADD the seasoned chicken and cook, turning once, to desired doneness. Remove from heat and transfer cooked chicken to a large bowl. STIR in the jasmine rice, cover with a lid and reduce heat to low. WARM the contents of olive oil packets in same large skillet over medium-high heat. 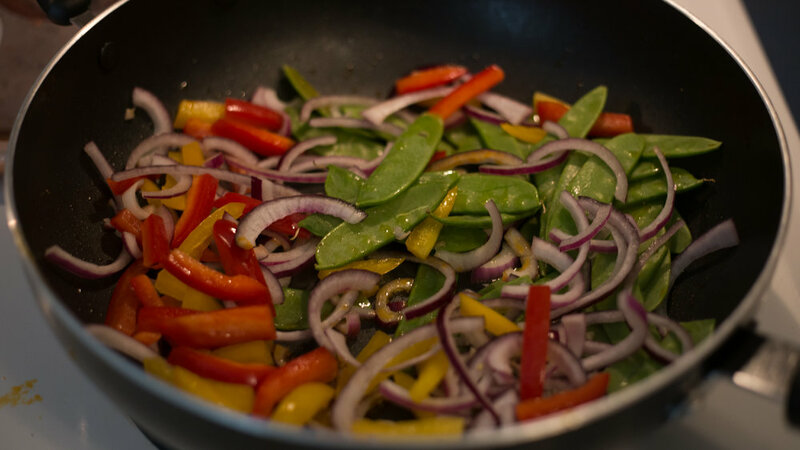 STIR in the red onion, bell peppers and snow peas, and sauté until crisp-tender, about 3-5 minutes. MIX in the cabbage and sauté another 5 minutes. Season to taste with salt and pepper. TRANSFER to large bowl with cooked chicken and cover with a lid to steam. WARM the remaining hot chili oil in the same large skillet over medium-high heat. ★ For MILD, use HALF of the chili oil provided in your kit, along with an equal amount of regular extra virgin olive oil. ADD the broccoli and sauté until they begin to brown but are still bright green and crisp-tender. STIR in the garlic and ginger paste, and remove from heat. ADD the sautéed broccoli, basil paste, chopped green onion and hoisin sauce to the cooked chicken and sautéed veggies. Stir to combine. SERVE over cooked jasmine rice and enjoy with the fortune cookies! Offers aromas of grapefruit, lychee and lime zest lead to flavors of mandarin orange and green apple, followed by delicate notes of mineral and white tea. This golden ale has a light to medium mouthfeel that delivers a honey-like malt sweetness that gives way to a crisp, clean finish with a touch of lingering citrus/herbal hop flavor.